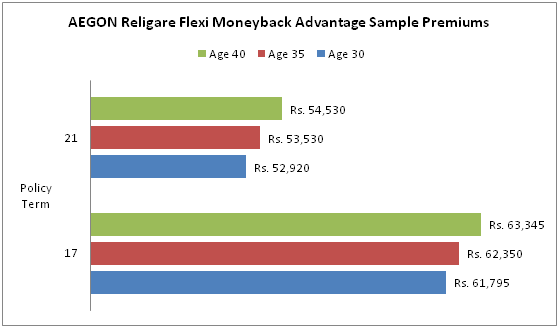 AEGON Life Flexi Money Back Advantage Insurance Plan is a limited payment money back insurance plan with bonus facility. 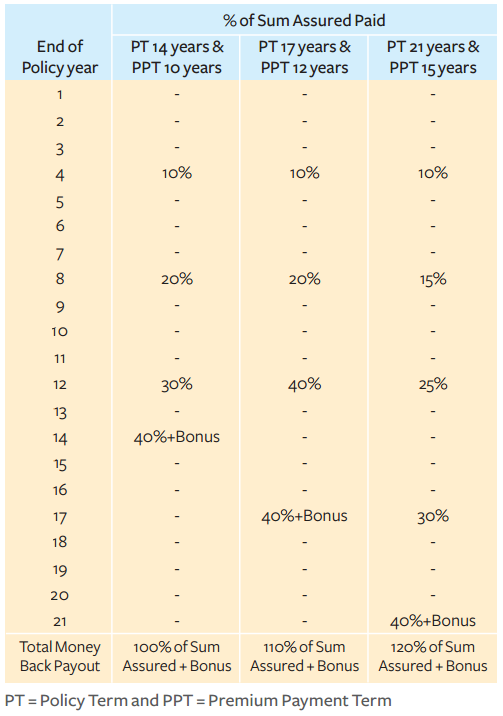 In this plan, there is Money Back given as per schedule in a pre-defined format. The remaining 40% of Sum Assured along with accrued simple Reversionary Bonus + Terminal Bonus would be paid as Maturity Benefit on survival till the end of the Policy Tenure. Death Benefit – In case of death of the Life Insured within the Policy Tenure, the nominee gets (10 X Annualized Premium) or (Sum Assured + accrued bonus, if any), subject to a minimum of 105% of total premiums paid. The above payout will be irrespective of the periodic survival benefits already paid. Maturity Benefit – On survival till the end of the policy tenure, the policyholder gets the remaining 40% of the Sum Assured + accrued simple Reversionary Bonus+ Terminal Bonus as Maturity Benefit and the policy terminates. Income Tax Benefit - Life Insurance premiums paid up to Rs. 1,00,000 are allowed as a deduction from the taxable income each year under section 80C and the Maturity Proceeds are tax free under section 10(10)D subject to fulfilment of terms and conditions. You stop paying the premium- If the policy holder stops paying the premium, the policy lapses and all benefits cease. However, if at least 2 years’ premiums have been paid, then the policy gets converted to Paid up Policy and continues with reduced benefit. The policy can however be revived within a period of 2 years from the due date of the first unpaid premium. You want a loan against your policy – Loan facility is available from the 4th policy year onwards upto 60% of the Surrender Value and a minimum of Rs 5,000.